You'll be £5.20 closer to your next £10.00 credit when you purchase Ironbridge in the Great War. What's this? Famed as the birthplace of modern industry and the first cast iron metal single span bridge, Ironbridge is venerated the world over yet its social history is at times unfamiliar. One hundred years ago this sleepy town, set by the river Severn, willingly volunteered its life-blood to a war that everyone confidently believed would be a short-lived, adventurous romp. Misled by government propaganda, they soon discovered through fighting relative's letters and various official news reports, many of which are unearthed for the first time throughout this book, that it had rapidly degenerated into an endless morass of bloody violence with the probability of their men meeting a painful death on a daily basis thrown in for good measure. The town's wartime heritage is one of enterprise and hard work as the majority of the Great War gun-fodder comprised working-class men drawn from prestigious local companies. Maw & Co, the world-famous ceramic tile maker, raised its own company of enlisted fighting men, in common with other businesses nationwide, that were known as Pals Battalions. As in most instances across the land, it subsequently paid a heavy price for this mass act of patriotism. 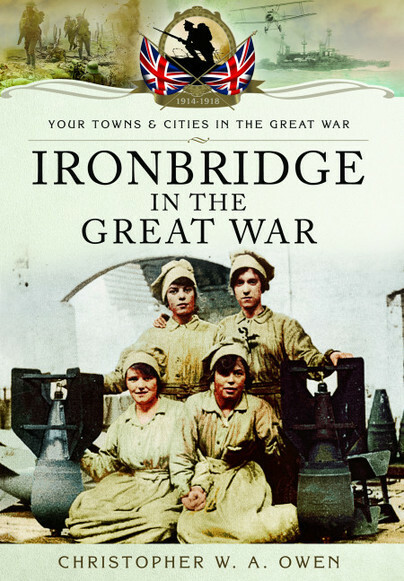 Ironbridge also became a cradle of the fledgling women's wartime workforce, who helped produce vital heavy munitions components at another famous local company's works. Ironbridge in the Great War is the story of the town's great sacrifice, as evidenced by the numerous and diverse war monuments that populate the town and its surrounding hamlets. This is detailed work that includes fascinating facts about the town, which, despite being constantly under the world spotlight, remained, until now, a part of its hidden wartime social history. He [Christopher W A Owen] has put people at the heart of his book, which includes stories of many who served, and many who died. He sets the local scene against the backdrop of the wider context of events on the national stage and the battlefield. Of particular value to family historians is an alphabetical list of the Great War casualties of the Ironbridge area.